Bamboo is gradually being recognised as a globally important biomass resource. Bamboo biomass can be used directly as fuelwood; modified into charcoal for cooking and heating; or converted into gas for thermal and electrical energy generation. It is a strategic – but often overlooked – resource for achieving United Nations Sustainable Development Goal 7: ‘Ensuring clean and sustainable energy access for all’. Bamboo as charcoal.More than 2.7 billion people – 38% of the world’s population – are estimated to rely on solid biomass for cooking. However, this wood is often harvested unsustainably and is a principal driver of deforestation in some countries. By contrast, bamboo can be harvested in a relatively short period and does not require re-planting, so it provides a continuous supply of material. Using bamboo for cooking and heating can take pressure off other forest resources, avoiding deforestation. As well as this, bamboo charcoal burns without smoke and odour, providing intangible health benefits for women in the home. These qualities make bamboo a suitable bio-energy resource for domestic as well as industrial applications. 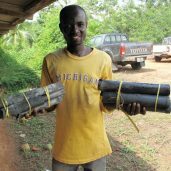 Bamboo cultivation and conversion into charcoal also offers great potential for income generating options: a rural household could earn over USD 1000 a year from producing bamboo charcoal. Bamboo as biomass for gasifiers. Bamboo has great potential to generate thermal energy, as well as electricity, through gasification. It is locally sourced, grows fast and compares well to other forms of biomass for gasification. 1.2kg of bamboo produces one kilowatt hour of electricity – this is similar to the biomass requirement for wood or timber, and better than other types of powdered biomass such as saw dust or peanut, coffee and rice husk. 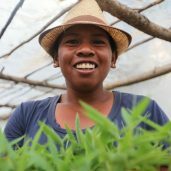 In Madagascar, INBAR is demonstrating the power of bamboo. A 25kWh bamboo gasifier is being built which aims to power a training facility and around 250 local households. 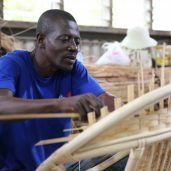 With further applications and pilot projects, bamboo biomass can become a strategic tool to meet a range of international development goals, including the Paris Climate Agreement, the Bonn Challenge, REDD+ and the Aichi Targets. 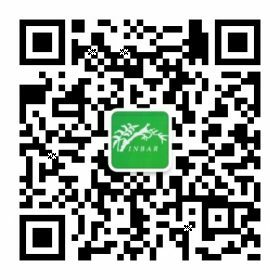 INBAR is an Observer to the UN Framework Convention on Climate Change and has worked across the world on bamboo bioenergy projects.